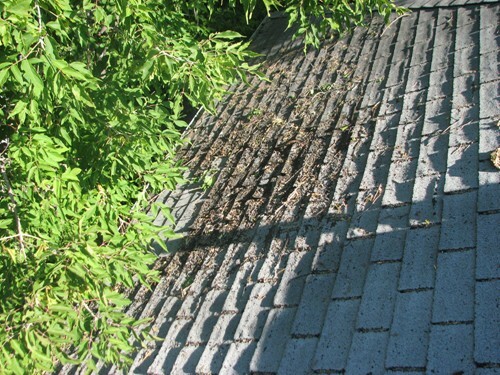 How do trees affect my roof? Tree branches rubbing on shingles here are a bad combination. Here is a photo of the results of a few years of the action of the wind in the willows so as to speak. You can see the difference between where the shingles have been worn by branches and where the branches didn’t touch. Allowing this to happen will shorten the life expectancy of the shingles by seveal years.